Why Are Noise Cancelling Full-Size Bluetooth Headphones the Perfect Combination? If you’re reading this article about the best noise cancelling headphones under $100, it probably means you need a pair of these or you just want to learn something about noise cancelling technology. Either way, we are sure we can help you. This article introduces you to this relatively new technology that has become widely popular all over the world, it explains where and how it is used and why do we need products like these. 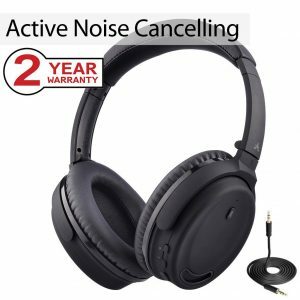 It also shows what types of noise cancellation are there and what are their advantages and disadvantages. 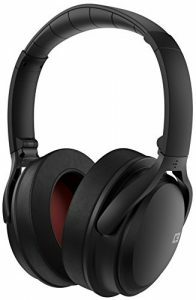 If you stay with us, we will present to you 15 pairs of the best noise cancelling headphones we could find at more than reasonable prices in comparison to what they have to offer you in return. As we have said, noise cancelling technology is still considered new and not completely developed technology that is being constantly improved. It has appeared due to the important lifestyle changes during a few last decades. There are more and more people who move to big cities in search for a better job, more options for entertainment, etc. Cities are becoming very crowded and people who can stand everyday city noise are very rare. It is kind of interesting at the beginning but, after the adaptation period, they all just want to avoid it as much as possible. This is where people decide to get headphones. They use them to make everyday activities like commuting and walking along crowded streets more bearable. The problem is regular headphones can’t really shut out the noise around them. Luckily, noise cancelling headphones can help a lot. They can’t shut out all the noises but they can reduce them to more than satisfying level. As you will be able to see in the text below, there are two types of noise cancellation. They work in different ways and they both have their good and bad sides but that can’t diminish all the positive effects of their use. Most of the noise cancelling headphones are actually Bluetooth headphones and their noise cancellation can be turned on or off depending on your needs and preferences. Some of them can also be used as wired or wireless. All these features make them user-friendly and very popular. You can use them at home with the disabled noise cancellation feature and you can turn it on when you go outside. Most of them have powerful and durable batteries but when you run out of it, you can plug in the cable and keep listening to your favorite music. Active noise cancellation or active noise reduction is the actual technology that we are talking about. Its work is based on the process of interference. If you observe every sound as one sound wave, then the sum of all the sound waves (sounds) from the outside world enters our ears and our headphone cups. ANC technology creates the opposite sound waves (waves with completely different/opposite phases) but with the same amplitudes. When a sound wave from the outside world enters our cups, ANC technology creates the exact same wave with the opposite phase. These two waves cancel each other and this is how the ambient noise disappears in your cups before you are able to hear it. Most of the quality ANC headphones are very expensive but there are some very good cheaper models that you can find on our list of 15 best noise cancelling headphones under $100. They are far from perfect but they will definitely make your life much easier. Passive noise cancellation is also known as the noise reduction. Unlike the previous type of noise cancellation, noise reduction is not actually the technology. It is based on the physical features and characteristics of your headphones and the level of eliminated ambient noise will directly depend on the parameters we are about to list. Any kind of headphones (no matter if they are earbuds, on-ear or over-ear headphones) offers certain level of noise reduction. With earbuds, the amount of reduced noise depends on the shape and size of the ear tips and how well they fit your ear canal (how well they seal it). If the tips are too small, more noise will enter your ear. On-ear headphones are not so good when it comes to noise cancellation as they just lay on your ears while full-size over-ear headphones are the best option because they actually surround your ear and physically isolate you from the noise. The thicker the pads, the amount of the blocked noise will be bigger. This also depends on the fit. If the cups are too big for your ears, more noise will come in and you will be able to hear it. Cowin E7 are very popular and quality active noise cancelling headphones that don’t cost too much. They are priced reasonably and they offer a lot for the money. They support Bluetooth 4.0 and NFC pairing technology. The headphones have 40mm driver, the frequency response spans from 20 Hz to 20 kHz, the impedance is 32 Ohms and the sensitivity 75dB. The battery lasts up to 30 hours per charge and the headphones weigh 0.85 pounds. The headphones come in many different colors (black, red, blue, red, purple, white). The headphones come in a nice box with the 3.9 ft long audio cable, USB charging cable, carrying case, user manual, and 18-month warranty card. As we have previously said, Cowin E7 are great reasonably-priced headphones. We like their design and the range of colors they are available in. The padding size can be adjusted to the size of your head, it is relatively soft and comfortable while the cushions on the cups are quite thick and spacious. The headband is flexible and the cups can swivel for 110 degrees so you don’t have to worry if the headphones will fit or not. The headphones are very easy to use and all the controls are highly accessible. Most of the control buttons are located on the right earcup where you will find the Bluetooth pairing button, ANC on/off switch, volume controls (also used for skipping tracks), play/pause button used for answering calls and the cable connector. On the left earcup, you will find only the USB charging port. In addition, the headphones can be used as both wireless and wired (in case you prefer wired headphones or you run out of battery). The battery will last for at least 24 hours and after only 10 minutes of charging, you will be able to use the headphones for a whole hour. The build quality is relatively good but with some flaws. The headphones seem very durable yet very flexible and without the annoyingly strong clamping force. The headband is metal and it has some reinforcements on the hinges. The sound quality is good considering the price and all the other features. E7 headphones deliver relatively balanced and pleasant sound with quite distinctive mids and highs. The bass is also present and pleasant. The headphones support ANC but it can be turned off and they will still sound good because their passive noise cancellation is also very good. One of the main problems you might experience with Cowin E7 is related to ear pad durability. It is very likely that the paint will peel off after a certain period of use. Also, the hinges can crack if you expose the headphones to severe use. In addition, the padding could be softer and it could have thicker padding. We would also like to mention the glossy finish on some parts of the headphones that we don’t really love. When the sound quality is concerned, we have to notice that the headphones work excellent with electronic music but they won’t sound so good if you play other genres. Also, active noise cancellation can’t be used in wired mode. One more problem with this technology is that it really changes the sound and affects its quality. 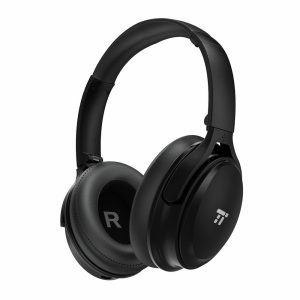 TaoTronics TT-BH22 are inexpensive full-size headphones that can be used as both wired and wireless. They support 4.2 Bluetooth version, they feature CVC noise cancellation and built-in mic, and their battery can last up to 24 hours. The headphones have 40mm drivers and they come in black color only. On the right earcup, you will find the micro USB charging port, volume controls (also used for changing tracks), and play/pause button that is also used as the pairing button. On the left side, there is the 3.5mm port and the ANC on/off button. The headphones come in a nice box with the carrying case, 47-inch long 3.5mm male-to-male auxiliary cable, 32-inch long USB to micro USB charging cable, and user manual. The headphones have a very attractive and simple design. The matte finish makes them look rather elegant. The headband is adjustable and very flexible. It is nicely padded as well as the cups. The cushions are quite thick, spacious and comfortable so we think almost anybody would find these headphones pleasant for wearing. The clamping force is reasonable so you won’t feel any pain even after a few hours of constant wearing. The cups swivel and fold which makes them not only comfortable but also easy for transporting. The pads are replaceable and the cable is detachable which prolongs the life of the headphones a lot. In case you run out of battery, you can always plug in the cable and continue listening to music. If you always stick to the Bluetooth technology, you would be happy to hear that the Bluetooth connection is stable and that the pairing process is quite easy. The sound quality is actually better than average considering the price point. The mids, highs, and lows are well balanced and distinctive and the noise cancellation technology allows you to block up to 70% of the ambient noise. Some customers claim the sound quality is much better when the ANC is on. The headphones can get very loud while the sound remains decently clear even at high volumes. Some kind of humming noise can be heard when the ANC is on but there is no music playing. It is normal for any ANC headphones but we still have to mention it. The headphones are mostly made from plastic. We know we can’t expect much from budget headphones but it would be better if there were more metal parts. When it comes to sound quality, we have to notice that it is rather muffled and unpleasant for listening when the ANC is off. Bitzen are reasonably-priced Bluetooth headphones that offer a lot for a decent amount of money. They have 40mm drivers, they aren’t too heavy, they support Bluetooth 4.0 version with 33ft signal range and their battery can last up to 12 hours per single charge. The headphones come in black color only. They have a built-in mic, they support active noise cancelling technology that reduces up to 85% ambient noise and they are compatible with all kinds of devices (Android, Apple, laptops, etc.). You will find all the necessary control buttons on the headphones. There are volume controls that are also used to skip tracks, power on/off button, Bluetooth pairing button, ANC on/off button as well as the line-in slot and micro USB charging port. The headphones come in a very nice cardboard box with a 3.5mm male-to-male detachable audio cable, USB to micro USB charging cable, hard-shell carrying pouch, and user manual. 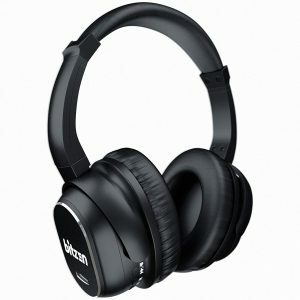 Bitzen headphones are full-size headphones that look quite simple and attractive. One of the things we really appreciate is the matte finish because it looks clean and doesn’t attract fingerprints. They aren’t too large or heavy, the headband size can be adjusted to the size of your head just like the cups position can be adjusted to your ears thanks to their ability to swivel and rotate up to 90 degrees. That also makes them easy for transporting. The headphones seem solidly built and quite durable. The headband is relatively comfortable and the pads on the cups are quite thick and soft. The cable is detachable, which prolongs the life of your headphones because it is easier (cheaper) to replace the cable than the whole pair of headphones. In case you don’t like cables, you can use these as Bluetooth headphones. Thanks to their durable battery, it is highly unlikely to stay without juice as 12 hours at moderate volumes is more than enough for most of the daily activities. In case you do run out of battery, you can simply plug in the cable and enjoy endless music. The sound these headphones deliver is more than satisfying for the price you pay. Don’t expect audiophile sound quality as you would have to pay much more for that but these will be more than good for any ordinary customer. With the ANC that can be turned on and off, it gets even better. These aren’t the best-looking headphones on the market. The pads don’t seem very spacious – the people with bigger ears should consider some other model from our list of 15 best noise cancelling headphones under $100. We would like to warn you that ANC tends to use more battery when it is on, so don’t expect 12 hours of constant playback if the ANC feature is on. 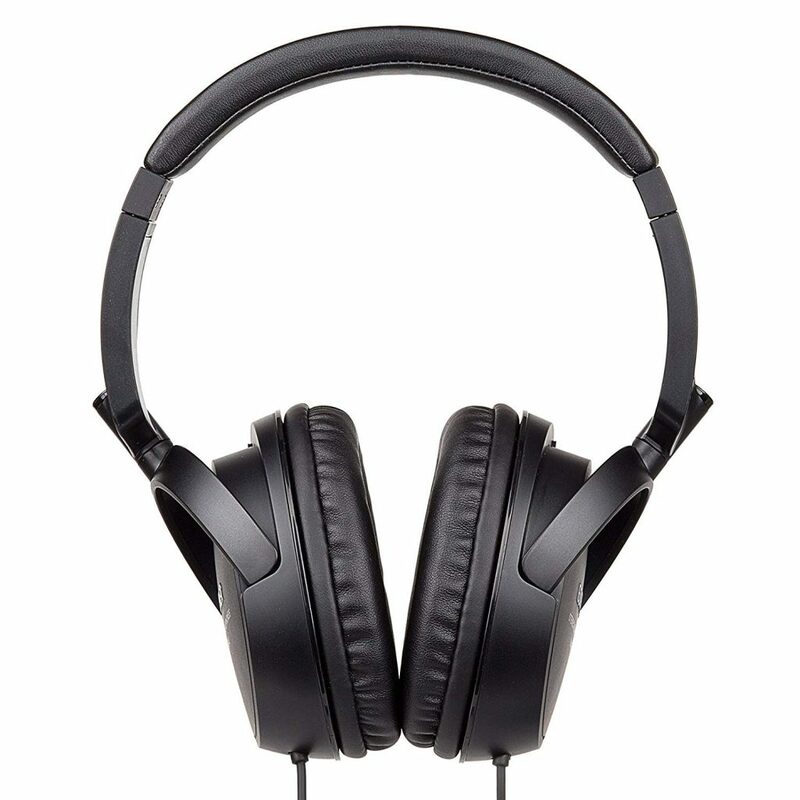 Edifier H840 are very popular and quite affordable wired headphones. They come in black, blue and white colors. The headphones have 40mm drivers; the impedance is 32 Ohms, sensitivity 90 dB and the frequency response spans from 20 Hz to 20 kHz. The headphones weigh 6.7 ounces. H840 come in the simple package without any additional equipment. You will get your wired headphones with 6ft long auxiliary cable and 12-month warranty card. The headphones have very elegant and nice design, especially because of the matte finish that makes them even more attractive. They are simple and stylish. Their cable is Y-shaped and long enough to give you enough space to do other activities while listening to music. The headband is adjustable and flexible but it is still made from metal, which means it is quite durable. The cups can be slightly rotated, which means you shouldn’t have any problems adjusting them to your ears and the shape of your head. H840 are quite comfortable headphones. They don’t weigh much and their clamping force is not very strong. The cushioning is thick enough on both cups and headband so the headphones shouldn’t make pressure on your head. The ear pads are soft and spacious enough so they should lay nicely around your ears without any discomfort. The sound quality is decent considering the price. H840 don’t support ANC technology but their pads provide good passive noise cancellation and you should be able to listen to your favorite music without ambient noise interrupting you. Despite their attractive look H840 look plastic and we can’t deny it. They are cheap and they certainly don’t look more expensive than they really are. The Y-shaped audio cable is not detachable and it is quite long so it can be difficult to use the headphones outside the house. The cable would tangle a lot and it could make a real mess in your pocket or bag. The cable is also quite thin and it could be damaged easily. If the cable breaks, you would have to buy new headphones because you can’t replace the cable. If you take into consideration the fact that the headphones are plastic and not so durable, we wouldn’t recommend severe use. There are no separate controls on the headphones or the cable, so you have to use your phone or player whenever you want to adjust the volume. 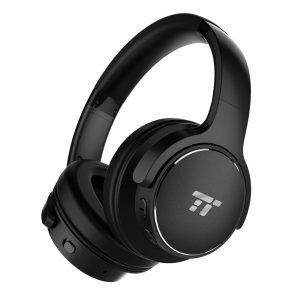 TaoTronics TT-BH040 are reasonably-priced Bluetooth headphones with active noise cancellation. They weigh 9.6 ounces, they support Bluetooth 4.2 version and the battery can last up to 30 hours per charge at moderate volumes. 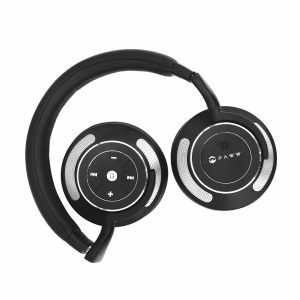 The headphones come in black color only and they can be used as both wired and wireless (Bluetooth) headphones. The controls are on the cups (power on/off button, ANC on/off button, volume controls) as well as micro USB charging port and the 3.5mm aux port. The headphones come in a simple white cardboard box with TaoTronics logo and the picture of headphones on it. In the box, you will find the headphones, sturdy zippered carrying case, 3.5mm male-to-male audio cable, USB to micro USB charging cable, travel adapter and user manual. One of the things we love about TaoTronics is their ability to make simple yet very attractive products. TT-BH040 have the nice matte finish that looks rather elegant. The headband is nicely padded so it won’t hurt the top of your head or put any extra pressure. It can also be extended and adjusted to the size of your head. The cups can swivel and rotate up to 90 degrees, which makes them easier for adjusting and transporting. The headphones are in general quite light and flexible so they should be comfortable for most of the users. The thick memory foam paddings on the headband and the cups make the wearing even more pleasant. The ear pads are spacious and soft and the clamping force is not too strong. The headband is made of metal and the headphones seem rather durable in spite of being plastic. The audio cable is detachable, which is great because if it gets damaged, you can replace just the cable, not the headphones. The battery life is more than satisfying as 30 hours are more than enough even for long trips. Bluetooth pairing is easy and fast and the headphones are compatible with a variety of devices. The sound TT-BH040 headphones deliver is very pleasant. The mids, highs, and lows are very distinctive and balanced. The ANC works nicely and you can even turn it off in case you aren’t using headphones in a loud environment. The headphones also have built-in CVC noise cancelling mic that you can use to take calls on the go. ANC won’t help much with the low-frequency sounds, so if you’re looking for a pair of headphones that will completely isolate you from the surroundings, these are not for you. Some customers were not satisfied with the mic quality. The headphones look comfortable and spacious but some users found them too small. If you see the price and all the features Avantree ANC032 headphones have, it becomes obvious why these headphones are so popular. They have 40mm drivers, they support 4.1 Bluetooth version, their frequency response spans from 20 Hz to 200 Hz while the impedance is 32 Ohms. The headphones weigh 0.4 pounds, they come in black color, they have the built-in mic and they can be used as both wired and wireless. The battery can last up to 10 hours when ANC is on or even 18 hours when ANC is off. The headphones feature low latency Bluetooth codec and they also support Headset, Handsfree, A2DP and AVRCP Bluetooth profiles. On the right earcup, you will find the ANC on/off button with the LED indicator light above it. There are also volume controls and on/off button that is also used for pairing, micro USB port and 3.5mm aux port. The mic is on the right side too, which means the left side has no controls or ports. The headphones come in a nice box with the carrying pouch, 24-month warranty card, user manual, USB to micro USB charging cable and 3.5mm audio cable. The headphones are very attractive. They come in black color with the matte finish and they look rather simple and elegant. The headband is nicely padded; it is not very robust and wide. It is flexible and it can be extended so that most people can wear them without problems, no matter how big their head is. The cups can swivel and rotate. The headphones can also be completely folded, which makes them easier for transporting. ANC032 are nicely built headphones. They aren’t the most durable headphones on the market but they can last if you treat them carefully. They are light and comfortable and they can be used as wired and Bluetooth headphones. The battery life is more than decent but if you do run out of it, you can always plug in the cable and continue listening to music, podcasts, etc. The ANC feature can also be turned on or off, depending on the situation and your preferences. The sound quality is good for the price and the noise cancellation works nicely. The headphones feature low latency Bluetooth codec and if you use them with Avantree Leaf, Avantree Priva III, and Avantree Audikast transmitters, you won’t experience problems with delays while watching movies or TV. The ANC doesn’t shut out every single sound around you so don’t raise your expectations too high. It can shut out constant low-frequency sounds but sudden sounds like screaming, car horns, etc. can’t be shut out. The sound and build quality aren’t perfect. After all, these are relatively cheap headphones with many features. Paww Wave Sound 3 are one of the most expensive headphones on our list of 15 best noise cancelling headphones under $100 and they are completely worth the money. They come in black and white colors, they can be used as both wired and Bluetooth headphones and they have 40mm neodymium drivers. 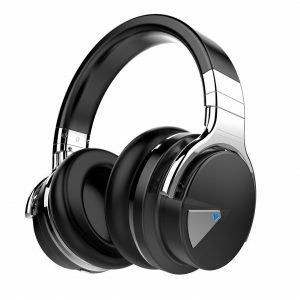 The headphones support Bluetooth 4.0 version, the battery offers up to 16 hours of playback time (after 3-4 hours of charging) and the ANC technology can be turned on and used independently from the mode. Wave Sound 3 come with a built-in mic and they weigh 12.8 ounces. On the right earcup, you will find power on/off button (also used as the Bluetooth pairing button), volume controls, track controls, Bluetooth LED indicator light, 3.5mm aux port, and mic. On the left, there are ANC on/off button, micro USB charging port and ANC indicator light. The headphones come in a very elegant box with their carrying case, 3.5mm audio cable, USB to micro USB charging cable, airplane adapter, and user manual. The manufacturer gives you a 12-month warranty card. Wave Sound 3 are good-looking headphones. They can be a great choice in case you don’t have enough money for those high-end Bose or Sony models. They have nice matte finish with some glossy metal details that are actually nicely put together. The headband is adjustable and it is made from metal with nice soft padding. This means the headband is strong and durable but it still won’t hurt your head or cause major discomfort even after a few hours of constant use. The cups are big and they have thick and very soft cushions. They are very spacious so you shouldn’t have problems with overheating or tightness. The cups can swivel and rotate and the headphones can be folded and transported in their hard-shell carrying case. Bluetooth works nicely and the pairing process is easy and fast. The signal range goes up to 25-30 feet. The battery life is quite satisfying although you can always plug in the cable in case you run out of juice. ANC technology is very useful as it blocks up to 20 dB of ambient noise and it can also be turned on or off depending on your preferences in different situations. The sound quality is very pleasant and balanced. The mids, highs, and lows are very distinctive and if you turn on the ANC while playing music, you will hear the sudden bass boost, which is great for bass fans. Noise cancellation works nicely and it allows you to listen to music, audio books or podcasts without turning the volume up to the maximum. All in all, the sound is amazing for the price you pay. Although the headphones look very attractive, the cups can be considered a bit oversized. When it comes to the build quality, we must notice that the buttons weren’t nicely built. They rattle a bit and it can be quite annoying. The headphones aren’t heavy but there are definitely some much lighter models on the market. After a few hours of use, you will definitely feel some pressure and weight. ANC can shut out only the low-end sounds but all the high-frequency sounds will be audible. 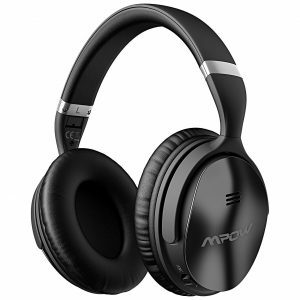 Mpow H5 are the inexpensive full-size Bluetooth headphones with active noise cancelling technology. They support 4.1 Bluetooth technology with 30 feet signal range, they have CVC noise cancelling mic, and they weigh 8 ounces. The headphones reduce up to 23 dB of ambient noise when the ANC feature is on and the battery can last up to 18 hours after 2 hours of charging. The headphones come in black color and on the right cup, you will find the ANC on/off button, 3.5mm aux port, and the ANC indicator light. On the left side, you have the micro USB charging port, volume controls, Bluetooth pairing (multifunctional) button and the Bluetooth LED indicator light. The headphones can be used in wired and wireless mode. The headphones come with the EVA carrying case, user manual, USB to micro USB charging cable and 3.5mm audio cable. H5 are good-looking affordable headphones with many useful features. They have very attractive design and in spite of the glossy finish, we like the wavy cup design. The headband is nicely padded and it can be extended. It is made from metal with some reinforcements on the hinges so these should be quite durable. The cushions on the cups are soft and comfortable. The cups can swivel and rotate and the headphones can be folded, put in their case and easily transported anywhere you want. The Bluetooth connection works great, the pairing process is fast and easy and the signal range is completely satisfying. The battery lasts long enough for most of your daily activities but if you run out of it, you can simply take the cable, plug it in and forget about battery limitations. When it comes to sound quality, we are completely satisfied with the sound these headphones deliver. It is balanced, powerful and punchy, which makes them the great replacement for some more expensive models. The lows, mids, and highs are well balanced and distinctive and we are sure you will enjoy using these. Many ANC headphones have the problems with this technology as the ANC affects the sound quality in a negative way. In this case, it is completely different. The ANC actually improves the sound quality. H5 have the same problem that all the ANC headphones have. The thing is that the ANC can’t protect you from the medium and high-frequency sounds like high-pitched human voices, horns, etc. The battery life gets shorter when the ANC is on. Nothing alarming to be honest but we thought you should be aware of that. The control buttons are very close to each other and the Bluetooth button is between the volume buttons so it might happen that you unexpectedly press the pairing button instead of turning up/down the volume. The mic doesn’t work very well because it’s far from the user’s mouth and your voice can sound muffled to the person on the other side. The headphones sound much better when the ANC is on so you would probably want to keep it turned on all the time and this will affect your battery life. LinkWitz VT-H88 are inexpensive ANC Bluetooth headphones with 40mm drivers. They support Bluetooth 4.0 version with 33ft signal range and the ANC manages to isolate up to 85% of ambient noise. The headphones have a built-in mic, frequency response spans from 20 Hz – 20 kHz and the battery can last up to 16 hours at 50% volume while it lasts up to 8 hours if you turn on the ANC. Charging takes 3 hours and they weigh 9.8 ounces. The headphones come in silver and steel silver colors. On the right earcup, you will find volume controls, track control buttons and the multifunctional button that is used for turning the headphones on/off and pairing. There are also 3.5mm aux port, Bluetooth indicator light as well as the built-in mic. On the left side, you can find the ANC on/off button, ANC indicator light, and micro USB charging port. The headphones come in a very nice cardboard box along with a sturdy carrying case, USB to micro USB charging cable, 3.5mm audio cable, and user manual. The manufacturer also sends a 12-month warranty card. LinkWitz VT-H88 are nicely designed headphones – that attractive combination of black and silver colors looks really nice on them. They are big and comfortable; the headband is relatively soft and flexible. Its size can be adjusted to the size of your head and the cups swivel and can be rotated up to 90 degrees. The headphones can also be folded and nicely packed in their carrying case, which makes them very suitable for traveling. The cushions on the cups are covered with a pleasant leatherette; they are soft and spacious so most of the users should find them comfortable. The headphones can be used as Bluetooth or wired headphones. The pairing process is fast and simple and when you run out of battery, you can simply plug in the cable and enjoy the music. They are compatible with different Bluetooth-enabled devices (TVs, PCs, Android or Apple devices). VT-H88 are quite durable, they have many metal parts (headband, the front side of the cups, hinges, etc.) so they should last you some time. When it comes to sound quality, we must say we are completely satisfied considering the price of these headphones. The sound is clear (even at high volumes), there is no significant distortion, the mids, lows, and highs are distinctive and nicely balanced. We are sure you would enjoy them. ANC technology works nicely and allows you to enjoy music, audiobooks, and podcasts without listening to an annoying crowd from the outside world. The headphones have quite big cups and some might consider them a bit bulky. The padding on the headband should be thicker and softer as some customers complained about headphones being uncomfortable after a few hours of wearing. The control buttons could be designed differently as you can hear the very loud clicking sound when pressing them. Some people find it rather annoying. Most of the features don’t work when the headphones are used in wired mode. 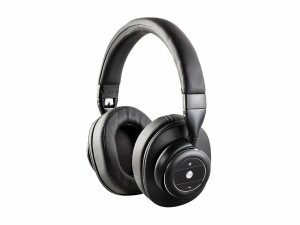 Monoprice SonicSolace are active noise cancelling headphones that support Bluetooth 4.0 version and A2DP, AVRCP, HFP and HSP Bluetooth profiles. The headphones weigh 12 ounces. They have 40mm drivers, their frequency response spans from 20 Hz to 20 kHz, sensitivity is 105 dB and the battery can last up to 16 hours without ANC (up to 8 hours with ANC enabled). The headphones can be used as both wired and wireless. SoundSolace come in black and brown colors. On the right cup, you will find the 3.5mm aux port, Bluetooth/multifunctional button, and the volume controls (that you can use to skip between tracks). On the left side, there is the ANC on/off button as well as the micro USB charging port. The headphones come in a nice black cardboard box along with micro USB charging cable, 3.5mm detachable audio cable, and user manual. You will also get 12-month warranty card. Monoprice SonicSolace headphones have the nice matte finish and we like the colors they are available in. These headphones have metal headband covered with soft and relatively thick padding. The headband can be extended which means that you can adjust it to the size of your head. The cups can swivel and they also rotate so you should be able to find the best position so that your ears don’t suffer. When you want to take them somewhere, just fold them and put them in your bag. The headphones have enough metal parts that we can consider them strong, solid, and durable. The headband and the hinges seem well-built and we think these can last for years if you use them with care. The Bluetooth technology works nicely, the pairing is fast and easy and the headphones are compatible with different Bluetooth-enabled devices. The battery life when the ANC feature disabled is more than satisfying but it gets much shorter when you turn on the ANC. If you like ANC and the battery dries out too fast, you can always plug in the audio cable and keep listening to music. When it comes to sound quality, we have to say these headphones sound surprisingly fine considering the price. The sound is pleasant and balanced (especially if ANC is off), and the headphones manage to shut out most of the low-frequency noises so they are a great choice if you are a frequent flyer. One of the things we have to warn you about is that activating ANC means boosting bass. And not just a little. There is a lot of bass and if you aren’t really into bass, you might consider buying some other headphones. Also, we have to be honest and say these headphones aren’t the best-looking headphones on the market. We usually love simple black headphones but we don’t really find these visually appealing. Sadly, the headphones don’t come with a carrying case. They are heavier than the average. Battery life (with ANC enabled) should be much better. Some customers claim these headphones were made for bigger heads. 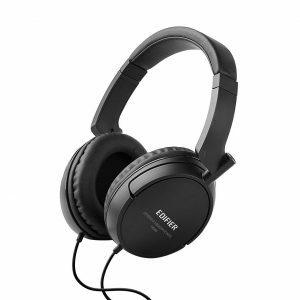 CB3 Hush are inexpensive full-size headphones that support Bluetooth 4.0 version and active noise cancellation that can be turned on or off (it eliminates up to 30dB of ambient noise). The headphones can be used as Bluetooth or wired thanks to the detachable audio cable. They have 110dB sensitivity, 32Ohm impedance and their frequency response spans from 20 Hz to 20 kHz. CB3 Hush have durable and replaceable lithium-ion battery that offers up to 15 hours of playback time after 2.5 hours of charging. The headphones come in black color only. On the left cup, you have the ANC on/off button and 3.5mm aux port. There is also the ANC indicator light. On the right side, there are volume controls (also used for changing tracks), the multifunctional button (play/pause, answer calls, pairing), Bluetooth indicator light, and micro USB charging port. The headphones come in a nice box with a 12-month warranty, sturdy carrying case, 1m long 3.5mm male-to-male audio cable, USB to micro USB charging cable, airplane adapter, and user manual. Hush headphones are affordable, good-looking headphones with a nice smooth surface and matte finish. They have the metal thickly padded headband that can be extended and adjusted to the size of your head. The cups are also adjustable. They swivel and rotate so you can pack them nicely in their case and take them anywhere you want. The cushions on the cups are very thick and quite soft. The holes are spacious so we think you shouldn’t have problems placing your ears there. The headphones don’t cost a fortune but they do come with numerous useful features. They have ANC that can shut out up to 30 dB of low-frequency noises around you. They also support Bluetooth with 33ft range. The pairing process is easy and simple and the headphones can be paired with two devices at the same time. The battery has decent life and you can get over 10 hours of playback even with ANC enabled. When it comes to sound quality, we must say these are quite good. They deliver balanced sound with distinctive mids and highs while the bass is slightly more emphasized than the rest of the frequencies. Even with the exposed lows, these headphones are great for rock and acoustic music. ANC works nicely and it doesn’t affect sound quality much. The mic is good but far from perfect. These headphones aren’t the prettiest or the most durable headphones on the market. They do feel a bit clampy or even too padded at first. After some time, they will adapt to your head. ANC shuts out low and medium frequency sounds but it won’t isolate you from high-pitched human voices, horns, etc. When using that built-in microphone, your voice might sound muffled and distant to the person you are talking to. Nothing alarming but it should be mentioned. 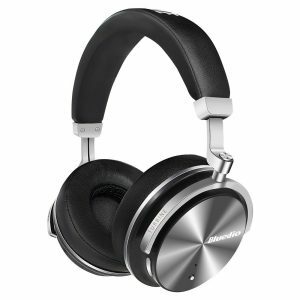 Bluedio T4S are the upgraded version of the Bluedio T4 headphones that were also very popular. T4S are very similar to their predecessors but mostly by design. These headphones use Bluetooth 4.2 with 33ft signal range, they feature ANC that can be turned off whenever you want, they have large 57mm drivers and their battery can last up to 16 hours per single charge (recharge takes 1.5 hours). The headphones have a built-in mic, their frequency response spans from 15 Hz to 25kHz, they have 116dB sensitivity, 16 Ohm impedance, and they weigh 11 ounces. T4S come in black, red and white colors and they have all the controls located on the right earcup. There are play/pause button, microphone, USB type-C charging port, volume controls and the ANC switch with the indicator light. The headphones come in a very nice and elegant black box along with user manual, USB type-C to 3.5mm audio cable, USB to USB type-C charging cable, and a soft velvet carrying pouch. If you’re looking for a relatively cheap and durable pair of headphones that sounds good, T4S are the right choice for you. They look rather interesting and modern and they have a lot of metal parts built in them which makes them rather durable. They have metal headband covered with thick and soft leather padding. It can be extended and adjusted to the size of your head. The headphones have metal hinges, they can swivel and rotate, which makes them even more adjustable and easy for transport. The cushioning on the cups is thick and soft. T4S can be used as both wired or wireless headphones. If your battery dries out, you can take the cable, plug it in and keep enjoying your music. They use one of the latest Bluetooth versions, the connection quality is great as well as the signal range. They also support fast charging. ANC can be turned on or off depending on your preference and it doesn’t really affect the sound quality. Speaking of sound quality, people say these sound great. The sound is clear, balanced and very pleasant. They do produce more bass than a regular pair of headphones which is great if you are a bass fan. ANC can make the music sound a bit flat but also clearer. Truth to be told, we find the headphones a bit large. They are smaller than regular full-size headphones but they would look bulky on a person with a smaller head. It is interesting that the cushions on the cups aren’t as big as you would expect them to be. They are round and they aren’t spacious, so you should take them off from time to time and let your head cool a bit. We understand the manufacturer used a lot of metal to make the headphones stronger but 11 ounces can be heavy if you’re wearing headphones for a few hours. ANC affects the battery life a lot. Naztech i9BT are inexpensive, nice-looking full-size headphones that can be used as wired or wireless. They support Bluetooth 4.1 version with 33ft signal range, they have 40mm drivers and the battery can last up to 30 hours per one charge (or 12 hours when both Bluetooth and ANC are on). Charging takes about 3 hours. They weigh 7 ounces. The headphones come in black color only with some silver details on the front side of the cups. On the left earcup, you will find the volume controls that are also used for skipping tracks, the multifunctional button that you can use to play/pause music, answer calls or enter pairing mode, Bluetooth indicator light, micro USB charging port, and the aux port. On the right cup, there are ANC indicator light and ANC switch. The headphones come nicely packed. Inside the box, you’ll find the headphones, 3.5mm male-to-male audio detachable cable, USB to micro USB charging cable, airplane adapter, and 6.3mm adapter. You will also get the user manual and 24-month warranty. Naztech i9BT are big and quite comfortable headphones. They have large cups that can actually fit nicely to the kids as well as adults. The headband is adjustable and it seems well-padded and comfortable. The headband follows the shape of a human head and it lays nicely on top of it. The cups are large and the cushions are spacious. They are covered with real leather and they are very soft. The cups can swivel and rotate, which makes them easy to adjust to the shape of your ears and your head. The headphones can be used in two modes (wired and Bluetooth). The signal range is good as well as the battery life even when Bluetooth and ANC are used at the same time because 12 hours should be more than enough for most of your daily activities. When it comes to the sound quality, we think it is completely satisfying considering the price and the available features. The sound gets better when you turn on the ANC but the bass is quite punchy and nicely exposed in both modes. If you are a bass fan, you will be completely satisfied. ANC works very well isolating you from the noisy surroundings. When it comes to design, we must say these aren’t the best-looking headphones on our list of 15 best noise cancelling headphones under $100. They are not ugly but the design could have been better. The control buttons may be difficult to use as they are almost at the same level as the housing is and they can be hard to find. Some of the control buttons can’t be used in wired mode (volume controls on the left side). There is the volume controller on the right side that can be used in any mode but that’s just the waste of space if you ask us. When using Bluetooth and ANC features at the same time, battery life gets much shorter. Some customers claim that the signal somehow depends on the battery life – the signal gets weaker as the battery life gets shorter. If you don’t get closer to the source, you will experience signal cutouts. When the ANC feature isn’t on, the sound quality drastically drops. The treble is almost inaudible and the sound is quite muffled. Some customers complain about headphones being cheaply built. 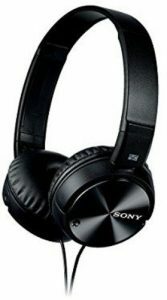 Sony MDRZX110NC are cheap wired headphones with 30mm drivers that support noise cancelling technology that can be turned on and off depending on the situation and user’s preferences. The AAA battery enables up to 87 hours of noise cancelling activity and the frequency response of the headphones spans from 10 Hz to 22 kHz. The headphones weigh slightly more than 5 ounces. They come in black color only and the only control button that you can find is the noise cancelling button on the right earcup. If you want to insert the battery, you can simply press the small button on the cup and the cup cover just pops out. Below the cover, you will see the place for the AAA battery. The headphones come in a simple box with the airplane adapter, user manual, and one AAA battery that is used for activating the noise cancelling feature. Sony MDRZX110NC are nicely and simply designed headphones. They come with the nice matte finish, they are amazingly light and very portable. The headphones have the adjustable and flexible headband. The cups are also adjustable and easily foldable. The cable is not too long if you like or tolerate the fact that your headphones have a cable. The cushions on the cups are very soft and pleasant for wearing. If these weren’t on-ear headphones, the cushions would be even more comfortable. The sound quality of the headphones is decent considering the price. You couldn’t really expect more. The sound gets better when noise cancellation is on because it’s clearer and the lows are more exposed. Noise cancellation works nicely isolating you from the most of the ambient noise. The headphones are foldable and portable but any kind of carrying case or bag would be a nice addition. The sound quality with and without noise cancelling feature is not the same. ANC activates low-frequency tones while treble is the most exposed part when the noise cancellation is off. Before you buy these, we must warn you that they are on-ear not over-ear headphones and that they can never be as comfortable as the full-size models are. Imagine Sony product being cheap. It is possible but you will never get the premium quality. These headphones are really basic headphones. The headband doesn’t have the padding, the headphones are really thin and they seem cheaply built. MDRZX110NC are wired headphones and you will have to deal with cables. MDRZX110NC use replaceable battery instead of rechargeable battery and that is something we find old-fashioned. Being on-ear, completely plastic, and without the padded headband, don’t expect them to be as comfortable as some other models on the list. These don’t come with any kind of microphone, built-in or inline. JVC HANC250 are one of the most expensive models on our list of 15 best noise cancelling headphones under $100 but they are worth every dollar. They are wired headphones and they come in black color only. They manage to shut out up to 85% of ambient noise, they have 40mm drivers and they weigh 5.3 ounces. One AAA battery ensures up to 50 hours of noise cancelling. The frequency response spans from 8 Hz to 24kHz, their impedance is 40 Ohms, and sensitivity 100dB. On the right earcup, you will find the noise cancelling button while the 3.5mm aux port is on the left side. The headphones come with the 4ft long detachable audio cable with 3.5mm connector, airplane adapter, 6.3mm plug adapter, and a sturdy carrying case. You will also get one AAA battery. 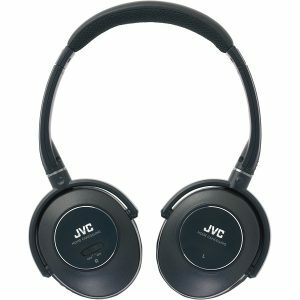 JVC HANC250 aren’t really full-size nor on-ear headphones. They are something in between but they are nicely shaped and definitely not bulky. Their weight is so small you won’t even notice them on your head, especially if the cups fit perfectly. The headband is extendable and nicely padded so the top of your head won’t hurt and you would be able to adjust the headband size to the size of your head. The cups are nicely padded and the cushions are quite soft and comfortable. The cups rotate and swivel, which makes the headphones very portable. The cable is detachable, which is really useful in case it gets damaged. You would just have to buy a new cable and not a new pair of headphones. ANC feature can be turned on or off and it is enabled by the AAA battery. The battery is supposed to be inserted into the left earcup. The headphones are plastic but they seem well built and durable. The sound these headphones deliver is pleasant, it has a lot of punchy bass and the mids and highs are distinctive and well-balanced. Noise cancellation works nicely and manages to shut out most of the unpleasant ambient sounds, which makes these headphones perfect for traveling by car, plane, etc. Activating noise cancellation feature will additionally improve the sound quality. These headphones could have been designed better, especially considering the money you are paying for them. There are no controls on the headphones nor on the cable. The only control button is the ANC on/off switch. The headphones sound much worse with ANC off. Wired headphones may deliver the best sound quality but wireless headphones are more practical and it would be nicer if these could be used in wireless mode. Despite being very popular and user-friendly, headphones are devices that stand on your head and on/in your ears so you should be very careful when buying them because they can cause great discomfort and we are sure you don’t want to endanger your head and hearing. This is why we have decided to list the most important characteristics you should consider before buying a certain model. It is not a secret that wired headphones deliver better sound than Bluetooth models. The problem is our active lifestyle. We are constantly in action, we spend all day walking, driving, riding on city buses, etc. This is where cables do more harm than good. They are often very long (1m or more) and they tangle in your pocket or your bag. When you try to pull something else from the bag, it is hard to find it because the cable is everywhere. It also can disturb you while doing something else because the cable is always in front of you, it hits your body and clothes. Bluetooth headphones are a great solution. They have no cables so you are free to do anything you want. There is no mess and no disturbance. However, their biggest flaw is the limited battery life. No matter how powerful it is, it will die eventually and you won’t be able to use your headphones until you recharge the battery. This is why we think the best solution is to buy the headphones with dual nature. These are headphones with detachable cables that can be used as both wired and wireless. After all, most of the models presented on our list of 15 best noise cancelling headphones can be used in this way. Headphones are products that can affect not only your hearing but also your general health. Most of us usually wear headphones for several hours straight and you will inevitably feel some discomfort after such a long time. This is why you should always look for lightweight and comfortable headphones. They should be as light as possible, made from pleasant and flexible materials. The headphones should be able to adjust to the size and shape of your head and ears. One of the most important things are the ear cups and their cushions. They should be thick but soft and pleasant for wearing. That way, you will be protected from the ambient noises and the headphones won’t press your ears too hard. As we have previously mentioned, Bluetooth headphones are great because they allow you to move around with more freedom and they don’t have annoying cables but they all have limited battery life. It is great that most of the Bluetooth headphones have rechargeable batteries and that most of them have relatively short charging time but it is also very important that you try to get the model with the battery life that suits your needs. If your lifestyle requires the battery that can last for more than 12 hours, there is no point in buying some model that offers less than that. Good seal is one of the most important characteristics of noise cancelling headphones, especially passive noise cancelling headphones. If the cups don’t fit, if they are too tight or too loose, the headphones won’t be comfortable and you will feel a lot of pressure or hear too much ambient noise. You might think that the headphones are badly built but, in fact, the problems are caused by the bad fit. Sound quality is crucial when speaking about headphones. No matter what other features they have, if your headphones sound awful, you will regret buying them. This is why you shouldn’t forget to check how your headphones sound before buying them. If you don’t have the opportunity to try them in person, read carefully the reviews written by other customers and try to figure out do you like that kind of sound. Some of the headphones sound better with ANC on, while the others sound better when ANC is off. If you’re going to use noise cancellation most of the time, you can buy those that sound better with ANC enabled. However, we think that the sound quality should be pretty much the same, with or without noise cancellation. No matter what you are buying, the price is one of the greatest factors that affect our final decision. If we don’t have enough money or if something isn’t worth its price, you should just give up and buy something else. One of the most important things here is to analyze your budget even before you start searching for your headphones. 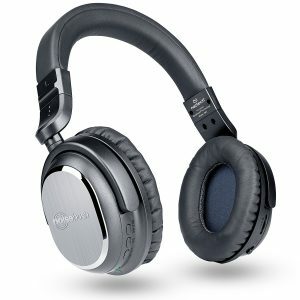 Define how much money you are ready to spend on a pair of headphones and what are the features you need or want to use. Your search will be much easier and faster that way. Although we believe the answer is obvious, we will try to elaborate on this subject. When you buy full-size Bluetooth noise cancelling headphones, you practically have it all placed inside one relatively small device. Those headphones are big, spacious and usually quite comfortable. They have big extendable headbands and adjustable flexible ear cups. The cushions are large and thick, and much more comfortable than ear tips or the cushions of on-ear headphones. Bluetooth technology makes your life easier because it saves you from long audio cables and the noise cancellation (no matter if it is passive or active) protects you from the ambient noise. The thing that makes these headphones even more perfect is the detachable cable that can be used in case the battery dies. If you would like to have headphones like these, scroll up and look at our list of 15 best noise cancelling headphones under $100. Most of them have all of these amazing features and they all come at more than acceptable prices. In spite of being very helpful, noise cancelling headphones have their own disadvantages (especially the headphones using ANC technology). We thought it would be fair to mention some of the most important disadvantages, too. If you have read our reviews, you have probably noticed that we usually mention the battery consumption with and without ANC. This is because ANC technology needs more power and you will run out of battery faster if the ANC feature is turned on. If you have ever head ANC headphones, you know what we are talking about. These sounds can sometimes be heard when there is no music and then disappear when the music starts playing but it sometimes appears at high volumes and it can’t be eliminated. This can be very annoying but it’s not equally noticeable on every pair of headphones. ANC technology is very appreciated among the customers and manufacturers are aware of that. This is one of the reasons why ANC headphones are more expensive than the regular ones. The other is the fact that they feature one additional piece of equipment that enables noise cancellation. If you want quality ANC headphones, you will have to spend more money than on regular headphones without noise cancelling technology. Even though many manufacturers are trying to hide it, this is the fact. ANC can eliminate up to 20-30 dB of ambient noise. This means they eliminate most of the low-frequency noises while you can still hear car horns, high-pitched human voices, and all the other high-frequency sounds. In our opinion, it is even better this way because you are still partially aware of the situation around you. We hope you enjoyed our article and that you have found some useful information. If you would like to have noise cancelling headphones that don’t cost a fortune, we recommend you to go through the list of 15 best noise cancelling headphones under $100 and find the model that suits your needs. I check all models on your list and see that Monoprice SonicSolace and Cowin E7 have the most customer reviews on Amazon site, which models to choose, any suggestion from you James? Out of those two you’ve mentioned, Cowin E7 delivers better performance for the money (better price/performance ratio). Monoprice SonicSolace headphones look better and sturdier and sound a bit clearer (less bassy), but E7 delivers a bit better noise cancellation and much longer playtime (30 hours without ANC VS 16 hours without ANC). 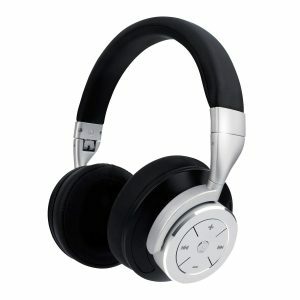 Also, Cowin E7 headphones are more than $20 cheaper. You are absolutely right about Amazon reviews – there’s a lot fake and unverified reviews. Small suggestion – when reading Amazon reviews, especially those 5-star and 4-star reviews, you should always use filters and eliminate unverified reviews. As for your question, the answer is yes. We do test the headphones. Our single reviews are more detailed than the reviews we write for the best of lists, but we don’t do single reviews for each headphone model. Out of those 15 headphones, we did single reviews of TaoTronics TT-BH22 and Paww WaveSound 3. If you want to know our favorites, we were pretty happy with Taotronics ANC headphones (not only TT-BH22, but also TT-BH040 and TT-BH060), COWIN E7 and E7 Pro, and Mpow H5. One thing you should be aware of is that none of these can deliver the same kind of performance and noise cancellation as you would get with much more expensive ANC headphones like Bose QC-35 or Sennheiser PXC-550. Hope this helped.